Firefall is a sci-fi MMO shooter that wants to differentiate itself from the competition by being fast, dynamic, and engaging. It tries to be dynamic by offering a host of random events spread across huge maps. It tries to be fast by throwing scads of enemies at you, forcing you to rely on your wits, your gun, and your battleframe's host of features. It tries to be engaging with it's customization and crafting options. It attempts to be all these things, and yet, after years of development, and just as much time spent in floor-spanning convention appearances, it seems to lose its way. At release, Firefall sets up an entertaining romp, but it loses steam when it should be gaining momentum, and ultimately ends up feeling flat. As a science fiction game, Firefall has lore for miles. Explained in a cinematic that plays every time the game starts, Earth is hit by an asteroid. Tracking had determined it was supposed to be a near miss, but apparently scientists in the future didn't take the Moon into account, and our satellite's gravity shifts the massive rock's trajectory. Before impact, the asteroid explodes into thousands of smaller pieces, lowering the status from full on ELE (Extinction Level Event) to just starting a government collapsing Nine Year Winter. Luckily, because we might as well look on the bright side after the sky tries to kill us, the asteroid is partially composed out of a substance known as Crystite. Capable of breaking the known laws of physics, Crystite launches mankind into a golden age. But come on, this IS humanity we're talking about, and since our growing civilization is based on finite resources, we are forced to the stars to find the source of the Crystite asteroid. Scientists, who I can only assume are not the same as those whot predicted the “near miss,” track the source to a world in the Alpha Centauri system. The new Earth government, called The Accord, decides that Alpha Prime needs some freedom and establishes a colony to start harvesting the mineral. If you're still reading, shiploads of Crystite are nice... but that's not enough. Mankind designs a ship that folds space to make faster then light travel a reality. Ignoring the lessons of noted documentary Event Horizon, humans fold space and unleash the Melding, a space storm of a ridiculous nature that transforms a portion of the Earth's populace in monsters, and leaves the rest reeling. Deep breath. That was a lot, wasn't it? All that exposition to reach the “beginning,” where you start as a mercenary fresh off a Melding Transport in a little corner of Earth called Copacabana. In this tropical themed hub town, a job board which that offers your first real mission. You will come back to this board until either you reach the maximum character level or decide to never come back. Classes in Firefall are determined by which battleframe you wear. These powered exoskeletons range from Dreadnaught, a literal tank, and the medic-centric Biotech. My experience was spent with the Assault and Engineer frames, or for those familiar with MMO parlance, DPS and DPS/Support. Armed with a Plasma Cannon, the Assault frame is a nice combination of agility and power, while the Engineer plays as kind of a pet class, able to drop turrets of differing varieties as well as shields and ammo/health refresh stations. On top of its class specific abilities, each frame also comes with a pair of jump jets. The mobility provided by the jump jets is the highlight of Firefall. From the moment I first activated them to my writing of this review, I tried to spend as much time in the air as possible. Jumping from point to point, climbing to the tops of buildings, the tops of mountains, hell, even leaping off the tops of those mountains just to see if I could feather the jets enough to not die (you totally can). Any opportunity to jump was an attempt to push the boundaries of the jump jets. As you can imagine, jump jets also change the feel of combat by adding verticality. While most enemies have either a jump or some kind of projectile to combat this, you still spend the majority of combat raining hell on your foes. That should sound like fun, and for the first 10 hours or so, it is. And then the fatigue starts to set in. There's just nothing else left to do. Every mission, except instanced versions that comprise the “main story,” is taken from a job board. Easily located in every hub, jobs can be taken in any order, and while many use minor narrative hooks to give the appearance of a cohesive story, they consists of going to a place, shooting something, and going back to the quest giver. Who talks to you over your radio. Even when you are right in front of them. It's a jarring design choice, turning everyone you interact with into a literal talking head. This has the same effect as MMO walls of text; I stop paying attention and pick out certain details, like "go here, kill that, and come back." It's an incredible shame, because some quests had the potential for excellent storytelling. Quests involving a band of poachers, the back story of your ARES dispatcher, or even an ex-merc turned career soldier who sneers every time you show up to save him; all of these are quests beg for more than a picture in the upper right hand corner of the screen and radioed dialog. It feels like Red 5 were almost there with the style and experience they wanted to bring with Firefall only to stop short of the finish line. The story feels more fleshed out during instanced missions that pop up every few levels. These are fairly well crafted, and scale nicely to allow solo or group play a fair difficulty curve. They are the most varied compared to standard job board fare. My favorite had me covering various entrances in a tower defense type mission, and as an Engineer, it felt great dropping a turret to cover one entrance while dashing to another. Crafting fall in line with the quality of the quests. It looks like a deep, engaging experience and features a tech tree seemingly pulled from a Civilization game. But rather then provide the information you need to make an informed choice, you're forced to semi guess and take chances spending research points on things you might never use. Outside of research points, most craftable objects require additional resources, like bars of metal or bug parts. While some of these are easily attained through combat, others have rare drop rates. Dropping 4000 research points to build a rare gun is fine if I know what I am getting ahead of time. But putting those points down only to discover that the recipe calls for an item I've never seen feels like a waste and makes me resentful of both the points spent and the time it took to research that item. "It's an MMO!" you say. "Certainly you could just go buy the items you need from the marketplace/auction house!" And you're right. 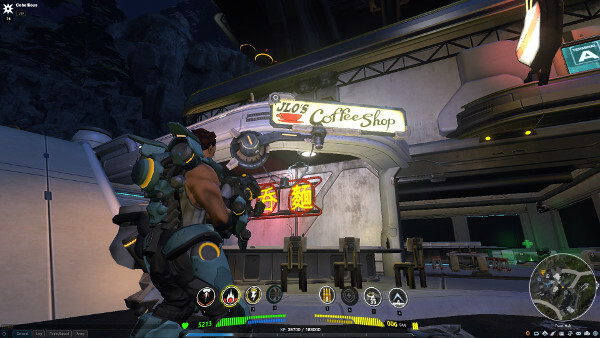 Unlike Elder Scrolls Online, which required you be a part of a guild to have access to an auction house, Firefall's Marketplace is easily accessible, with at least one access point in each of the major hubs. Where this idea, and the majority of free to play games fall apart for me, is in the application of multiple currencies. Everything, from quests to the random enemies you meet in the countryside, drop Crystite. The Marketplace and services, like resurrection, cost Credits. Want to purchase something from a vendor? I hope you have the correct currency used by that specific hub. If this confusion is the price we pay for free, I'd honestly rather pay per month. At least then I'd feel like my time was worth more then the currency I was able to gather and convert to a useable type. In the end, the experience Firefall offers is one that's almost there. It's almost a fully engaging, entertaining shooter. It almost tells a fairly good story. Its systems almost feel worth the time, or money, you would put into seeing them through to their end. It's almost there, but in the end, Firefall falls short. For what it brings to the table, PixelJunk: Monsters Ultimate is a great package. Tons of content, engaging gameplay, and a cute look really set it apart from other entries in the genre. I think it takes a huge step back in requiring perfect runs in order to progress to new areas, but when compared overall, it's one blemish on the surface of an immensely interesting experience. With so much of the story left to see, it's hard to make any definitive calls on the overall quality of The Raven: Legacy of a Master Thief. As for the first chapter though, I am waiting with baited breath to see where the story goes, and to continue on this adventure with Constable Zellner. For fans of the adventure genre, this is an easy one to recommend. For everyone else, there is nothing quite like a good mystery, and this, so far, is absolutely one of the good ones. If it can hold your interest long enough, and if you are enough of a fan of the action RPG to overlook its low points, there is an enormous amount of free content to take advantage of. With up to three characters earned through the game, and a story that took me about 14 hours to play, there is enough to keep you busy but necessarily entertained the whole way through. PlanetSide 2 is a hard game to sum up. It's a beautiful, solidly built shooter that presents large-scale conflict like nobody else in the business. The rest of the game's enjoyment, however, is entirely up to you. If you can dedicate the time to learning the systems, decoding the cumbersome UI, and finding a group of people that you like playing with, PlanetSide 2 will be a blast. Elder Scrolls Online is about as middle of the road as an MMO can get. It fails in some spectacular places for a multiplayer-based game, and in the same way I questioned what Zenimax was thinking when they announced it in the first place, I question just how long they'll be able to hold out before flipping the switch from paid subscription to free to play. In order to review this, I was gifted 60 days of playtime, which, as I finish writing this, has run it's course. While I don't regret my time in Tamriel, I think the most damning piece of criticism I can deliver is that I do not plan to re-up on my subscription. 60 days was more then enough time for me to determine that I would rather spend my time elsewhere.